Bold ideas have to vault a huge number of hurdles in interaction design. Novel, risky ideas end up on the cutting room floor, which is why so many apps are so similar. It was therefore exciting to see the new iPhone app from the business site Quartz. The app is a radical departure from all other news apps. Eschewing a homescreen, hierarchy or navigation, the app instead presents users with a conversational interface á la WhatsApp or Facebook Messenger. Each news story is a “message” that appears in the chat timeline, and the user can interact with the feed by sending “messages” to request more detail or receive another story. Selecting a news message opens the Quartz site in a webview, meaning the app does not contain any of Quartz’s articles itself. The app limits itself to 3-4 articles at a time, giving the user gets a brief digest instead of a massive data dump. The most joyous thing about the app is the copy: it has a distinct, playful tone of voice, and makes heavy use of gifs and emoticons. It really does feel like you’re chatting with a knowledgeable friend and not just interrogating a faceless system to request facts. The debt of influence to other conversational UIs such as Lark is also clear here. It’s also easy (in hindsight) to see why the design team at Quartz chose such a bold interaction. Providing a curated digest of the news matches the typical reading patterns of most users. News is consumed on apps first thing in the morning and during couch time after work, both being use cases where users have either divided attention and/or limited time, meaning a summary is particularly appropriate. Yahoo news digest, for example, also does this admirably well. Moreover, the vast majority of online news is now consumed through social media, with users accessing content via shared links rather than through the homepages of news sites. 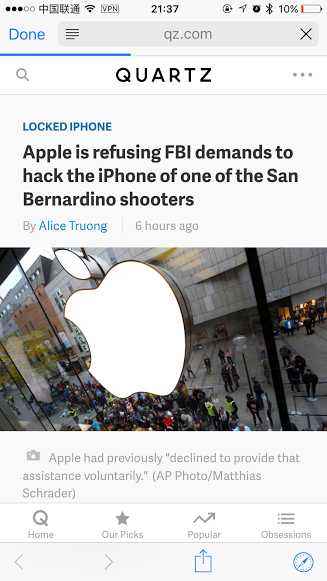 A news app that recreates the hierarchical structure of a news site is in many ways just as redundant. Recreating the sharing experience of social media – one particularly familiar to a generation who grew up with Facebook, WhatsApp and Snapchat – shows an understanding of how users expect to receive content. The chat interaction also allows Quartz to inject some element of editorial voice, presenting them as a trusted, friendly guide to the news, in an age when the public’s trust in the media is at its nadir. Yet adding all of this personality comes at a cost – the interaction can be glacially slow as one waits for messages to be “sent” and “received” by the interface. Then there’s the tiresome hub-and-spoke navigation that requires users to open the webview, read an article and close it again to access the next one, which again requires the webview be opened. In short, it all feels quite toy-like and gimmicky, almost as if the app is intended as viral marketing for Quartz rather than as a serious news app. Whilst I’ve enjoyed using it for a few days so far, I do wonder how much lasting appeal there is to using a chat interface for news consumption. Moreover, whilst the app is ad supported, it doesn’t seem optimised for maximising time spent in-app, pages visited etc. – the sort of analytics that drive the business end of sites like Quartz. The intent may be for users to access the first article through the chat interface and then continue visiting the Quartz site within the webview, navigating from related article to related article. The toy-like nature of the app makes more sense when viewed this way – it’s a fun, playful way to access the Quartz site, rather than a robust experience on its own. Indeed, the playful aspect of the experience gives you a reason to visit the app of a fairly minor news site that you might otherwise ignore. This touches on the biggest issue with the app – does it need to exist? If the app is trying to solve the problem “in the age of social media, what should the app of a news site look like?” the answer seems to be “like social media”. Whilst users may download apps from major news providers (e.g. national newspapers, TV networks, etc.) and, at most, the app of a minor provider (e.g. magazines, online-only publications) or two (though given how few apps most users download this is unlikely) why should a minor news site even have an app? I wonder if “a playful way to interact with the content” is really reason enough, when social media apps could themselves do something very similar with content. The future of online news, it seems, is as content streams on social media platforms. Facebook’s Instant Articles, Snapchat’s Discover tab and Twitter’s Moments tab point to a future when content providers operate as channels of these services, with the social media provider as all-powerful network and provider of advertising (and thus revenue) for these channels. Why, in this future, would a smaller content provider have its own app? I’m not suggesting that this is a desirable future – content providers stand to lose a huge amount of control to the likes of Facebook – but rather that it seems increasingly unstoppable. Making your news app mimic social media interactions is not, therefore, a visionary move but a sign of surrender: this is how our readers will consume their news, so we must respect that. If so, there is no reason for the Quartz app to exist as a standalone entity. Rather, making the app look and feel like a social media app suggests that we should just be using the real thing. A chat interface would make far more sense as, for instance, the baked-in news tab in WhatsApp, akin to SnapChat’s Discover tab. The future of news is social media, and imitating social media – no matter how playfully you do so – is just delaying the inevitable. 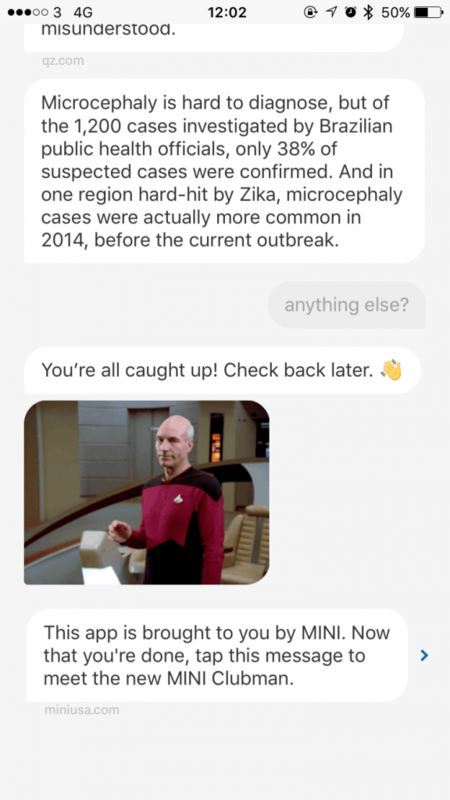 The new Quartz app is not the future of news – but the interactions that it simulates are.